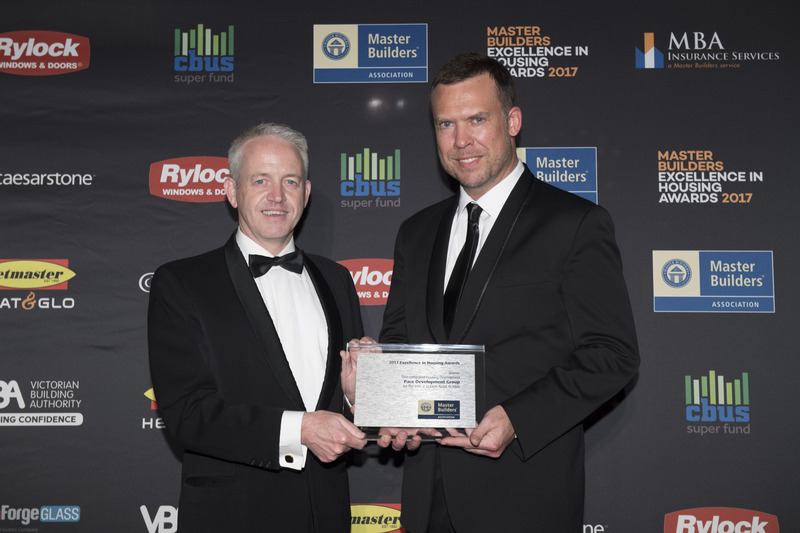 Well-versed in receiving praise within the development industry, Pace Development Group celebrated yet another win recently with their St Kilda project, The Icon, taking home the award for Best Integrated Housing Development at the Victorian Master Builders Excellence in Housing Awards on Friday, October 20th. Already well known and recognised by everyone who passes it, the striking 18-storey architectural statement lives up to its name. Comprising six stacked boxes of different shapes and sizes, multi-award-winning The Icon challenges the usual concept of a building not only in form but also in colour. The six boxes are stacked asymmetrically creating a unique and memorable addition to the skyline. And each of the boxes features powder-coated screens in colours chosen to reflect the suburb as a whole, as well as cleverly connecting the building into its environment – the colours become lighter as they progress up the building in a visual connection to the sky. As outlined in the appraisal by the Master Builders judging panel, the scope of work involved for The Icon was detailed and it was a deserved winner in the category. The award for Best Integrated Housing Development acknowledges a building that promotes community living with shared communal facilities & services available. The icon does this through the implementation of shared communal spaces and its external construction, a testament to Pace’s 22 years experience as an integrated builder and developer. Pace is no stranger to the Apartment Developments website, with recent projects including Pace of Collingwood and Pace of Doncaster East stirring up plenty of interest and, no doubt, more awards to come.